Carcinoembryonic antigen (CEA) describes a set of highly related glycoproteins involved in cell adhesion. CEA is usually present at very low levels in the blood of healthy adults. However, the serum levels are raised in some types of cancer, which means that it can be used as a tumor marker in clinical tests. Tumor Associated Antigens CA19-9 Antigens are substances that cause the immune system to respond. Carbohydrate antigen (CA) 19-9 is a type of antigen released by pancreatic cancer cells. It can also be referred to as a tumor marker. And increased serum levels of CA 19.9 in lung tumors, especially in adenocarcinomas, are a known fact, although uncommon. CA125 Increased serum CA125 level may have many diagnoses other than ovarian cancer, including breast, colorectal and lung cancer. 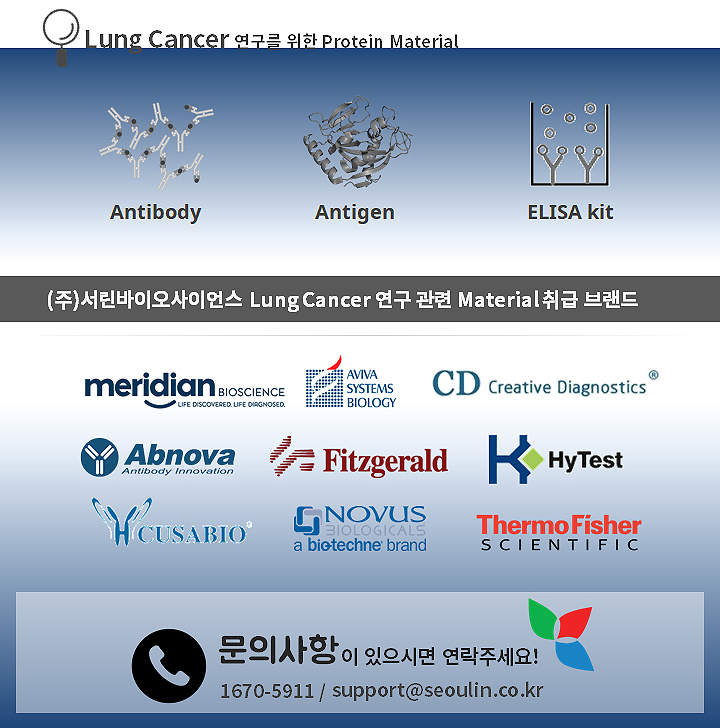 80% lung cancer patients were diagnosed at advanced stage. The CA-125 level may reflect the extent of tumor involved in pleura (tumor burden), it could be correlated with the prognosis. EGFR positive lung cancer refers to lung cancers that test positive for an EGFR mutation. EGFR stands for epithelial growth factor receptor, a protein that is present on the surface of both normal cells cancer cancer cells such as lung cancer cells. EGFR mutations are most common in people with lung adenocarcinoma (a form of non-small cell lung cancer,) are more common with lung cancer in non-smokers, and are more common in women than in men. Mutation Analysis The KRAS gene is one such gene, which is mutated in almost 25% of adenocarcinoma patients. Other mutations in lung adenocarcinoma occur in other genes, such as the EGFR, ALK, and ROS1 genes. (NSE) NSE is currently the most reliable tumour marker in diagnosis, prognosis and follow-up of small cell lung cancer (SCLC), even though increased levels of NSE have been reported also in non-small cell lung cancer (NSCLC). Cytokeratin 19 (CK19) is an acidic protein of 40 kDa that is part of the cytoskeleton of epithelial cells. It is highly expressed by all epithelial cells and represents a useful indicator of epithelial differentiation. The soluble fragment ofCK19 (CYFRA 21-1) can be a useful circulating tumor marker and can be detected in the serum of cancer patients. Cancer Stem cells Aldehyde Dehydrogenase Cancer stem cells (CSCs) are defined as a small population of cancer cells with the properties of high self-renewal, differentiation, and tumor-initiating functions. Recent studies have demonstrated that aldehyde dehydrogenase 1 (ALDH1) is a marker for CSCs in adult cancers.